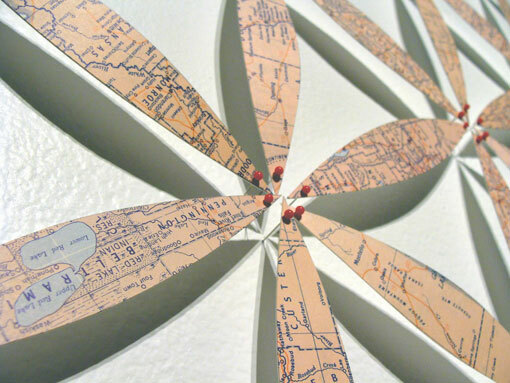 Shannon Rankin creates installations, collages and sculptures that use the language of maps to explore the connections among geological and biological processes, patterns in nature, geometry and anatomy. These new geographies explore notions of place, perception and experience, suggesting the potential for a broader landscape and inviting viewers to examine their relationships with each other and the world we share. Shannon Rankin was born in California in 1971 and currently lives and works in Rangeley, Maine. She received a Bachelor of Fine Arts from the Maine College of Art in Portland, Maine. Her recent solo exhibitions include Fathom, Center for Maine Contemporary Art, Rockport, Maine and Disperse / Displace, Gallery Voss, Düsseldorf, Germany. Her work is included in private and public collections both nationally and internationally. Select group exhibitions include Moving Maps, EPFL Rolex Learning Center, Lausanne, Switzerland; Maps, June Fitzpatrick Gallery, Portland, Maine, and Constructed Territory, Wright State University, Ohio. Her work has been featured in Elephant, Maine Home and Design, Maine Magazine, Papercraft 2, Data Flow 2, and Perfect Paper. Recent awards include the 2010 Center for Maine Contemporary Art Biennial Juror’s Prize, and residencies at the Bemis Center for Contemporary Art in Omaha, Nebraska, and the Vermont Studio Center in Johnson, Vermont.